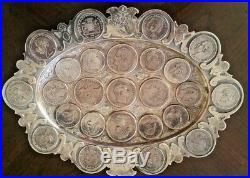 Offering very unique 25 Thaler inlaid coin tray made of 800 German silver. 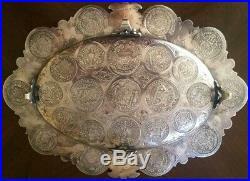 Tray is inscribed 3 April 1902 and I assume created by a jeweler as a presentation piece. Item is stamped on the back with, 7959. 800, a hallmark and the word'Aron. Tray is created from AUTHENTIC coins (not cast copies) and very professionally assembled in tray. Tray is a true estate find, which I obtained several years ago out of a prominent home in northern Virginia. Tray measures 12" long by just over 9 1/2" wide and stands about 1 1/8 tall at its highest point. The tray weighs 30.4 ounces or 860 grams as measured by my'non-calibrated' digital postal scale. Tray has four attached feet and appears to be high-centered there is a small amount of play when the tray is sitting flat, which does not permit all feet to rest evenly on a flat surface, and therefore provides for a moderate rocking. The tray is VERY solid and unyielding, as are the feet. I believe with a small amount of professional adjustment to the feet, the tray will rest squarely. I was unable to find anything similar on which to provide a like description. I understand the value of the tray rests more in its uniqueness and craftsmanship, than in its silver content and collectible coin value, which I understand is diminished for obvious reasons. I will say the coins used appear to be in very good condition and were probably selected so during the tray's creation to maximize its appeal. Also, as I looked at the photos, I notice they do not come close to representing the detail and beauty of the item. It is SO much more impressive than the pictures provide. You are getting what you see pictured. The item "Antique Prussian German 800 Silver Inlaid Coin Thaler Presentation Tray 1841" is in sale since Sunday, November 26, 2017. This item is in the category "Antiques\Silver\Sterling Silver (. The seller is "orient_express" and is located in Sterling, Virginia. This item can be shipped to United States.